This devotional is a collection of popular posts from Angie Smith's blog Bring the Rain. Each chapter focuses on the ways God can use people who are broken, people who feel as if they have nothing to give. She gets the idea for the book from a project she undertakes after the death of her daughter Audrey. Angie can't shake an idea that she read in a book on grieving - that breaking a piece of pottery can help with the healing process. So Angie shatters a pitcher and begins to painstakingly glue it back together. She realizes that "this pitcher was my life, and every piece was a part of the story that He had chosen to put together. I started crying, and remembering things I thought I had forgotten. It took a long time to finish, but it was time well spent. Every nook and cranny whispered to me, until at last it stood in all its imperfection. Here you are, Angie. 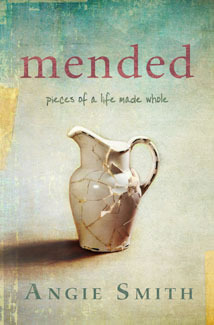 You are mended. You are filled with My Spirit, and I am asking you to pour yourself out. The image of my life as a broken pitcher was beautiful to me, but at the same time, it was hard to look at all of the cracks. I ran my fingers along them and told Him I wished it had been different. I wished I had always loved Him, always obeyed Him, always sought Him the way I should. I was mad at the imperfections, years wasted, gaping holes where it should be smooth. But God, my ever-gracious God, was gentle and yet convicting as He explained. My dearest Angie. How do you think the world has seen Me? If it wasn't for the cracks, I couldn't seep out the way I do. I chose the pitcher. I chose you, just as you are." This book is written in a very conversational way. It's easy to imagine that Angie has invited you over for a cup of coffee and a chat or that you happen to be in the same Bible study group. She is a gracious writer, open to telling you her failures and her fears. She discusses the ways in which we feel we are unworthy of God and his grace in relation to Peter, she imagines how our lives would change if we challenge ourselves to do just one better, and she learns about the way God directs our lives as she imagines what her future might look like. This is a good read, but perhaps it has more impact when it is savored. I read through the book in a few days and found myself engaged, but I didn't have the impulse to get through just a few more pages. If you are at a point in your life where you are truly doubting if God can love you in spite of your mistakes, this would be an excellent choice for insight from a woman who has been in that same dark place. My reviews of Angie Smith's I Will Carry You and What Women Fear can be found here. To the guys and gals of the FTC: I received this book from Shelton Interactive in exchange for an honest review. Thank you, Andrea!